Life's a real zoo at Legacy Farms, where 14 chickens, a couple of dogs and an assortment of horses with diverse temperaments learn to share their days on the sprawling homestead. 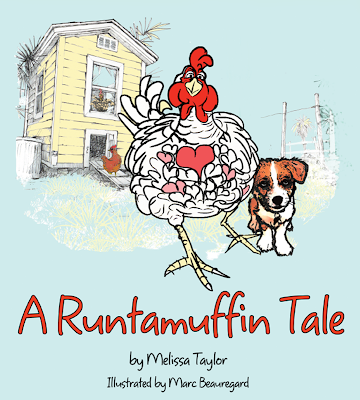 Based on the true life adventures of author Melissa Taylor's charming chickens, "A Runtamuffin Tale" is a delightful new children's book that follows the life of Runtamuffin — or Runti — a tiny chicken with a big personality. Runti becomes the first chicken brave enough to form a bond with one of the farm's largest inhabitants — a beautiful horse named Mariett. All the animals on the farm soon learn that differences in size and outward appearances don't mean a thing in this colorful tale that subtly interweaves valuable life lessons on sharing, believing in yourself, love, friendship, anti-bullying and mutual respect. The 57-page book, wonderfully illustrated by Marc Beauregard, targets children ages 6 to 12 and would make a treasured addition to any family's home or elementary school library. Author Melissa Taylor was born and raised in the small town of Nazareth, Pennsylvania. Taylor's mom filled her childhood home with animals, which cultivated Taylor's love and desire to surround herself with all types of four- and two-legged creatures. She currently lives, owns and runs a farm with her husband in South Florida with 14 chickens, 34 horses, 5 dogs and a cockatiel. Hardcover and digital download available from runtavision.com.